Consultation with other subspecialists may be called for. Management of pediatric patients with retinal trauma requires an individualized approach.1-6 No two trauma cases are alike, and there is insufficient scientific evidence to recommend one particular management or treatment approach over another. However, there are steps the surgeon can take to develop a clear understanding and plan of management in a given case. This article presents some guidelines to consider when faced with posterior segment trauma in a pediatric patient. 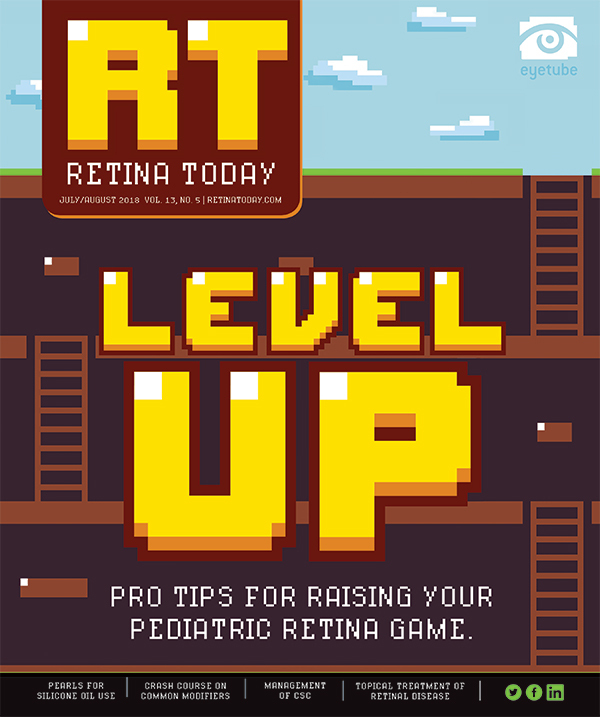 • Management of pediatric patients with retinal trauma is not one-size-fits-all. • Many pieces of the management puzzle, including patient history, examination, imaging, and surgical procedures, need to be tweaked for these young patients with small eyes. • Prevention of trauma is the best strategy for preserving the visual acuity of young patients. When a patient presents with trauma, whether acute or chronic, a careful history and examination are vital. If surgery is called for, it may need to be staged to address the initial task of stabilizing the infant if there is multisystem trauma. For the ophthalmic surgeon, prompt removal of intraocular foreign bodies (IOFBs) and closure of the globe in open globe injuries are the first orders of business, followed by vitrectomy to release anterior-to-posterior retinal or ciliary body traction to prevent or repair retinal detachment. Secondary surgical treatment may involve the use of scleral buckles or vitrectomy, depending on the extent and individual characteristics of the trauma. It can be challenging to obtain an accurate history of trauma from a pediatric patient. Infants are unable to describe what happened, and, if the trauma was not witnessed or is associated with abuse, accurate details may not be obtained from adults. Children with repetitive traumatizing behavior, such as hitting their head with their fist, may experience significant trauma that is missed when obtaining a medical history. During evaluation, the patient and/or parents should be asked for details about what happened, whether an object was involved, and the time and location of the traumatic event. Children with unilateral vision loss may not realize that it is abnormal. They may attempt to use the fellow eye to see the eye chart, not as cheating behavior, but rather as a method to perform their best. Thus, careful testing of vision is important in order to prevent vision loss from going undetected. Remember that not all pediatric patients who have undergone trauma present emergently. With any unusual presentation of retinal detachment, one must be suspicious of trauma. In patients with acute trauma, complete examination of the eye and adnexa is important, but these may be limited in pediatric patients. The goal of early examination is to determine whether surgery is indicated urgently and to form an idea of what resources and equipment will be needed for surgery. It is important not to force an examination in the clinic because pressure to hold the eyelids open may cause expulsion of intraocular contents. A careful examination under anesthesia (EUA) can be performed before surgery. Use of a portable slit-lamp in the OR can be especially helpful in these situations. Imaging studies may be needed in the management of pediatric patients with retinal trauma. Preoperative B-scan ultrasonography can be used to assess choroidal or retinal detachments or IOFBs in self-sealing wounds but might better be avoided in open-globe injuries or injuries that include a protruding IOFB. If no metallic IOFB is suspected, MRI scanning reduces radiation exposure in comparison with CT scanning. If a metallic IOFB is suspected, CT can be performed. For ophthalmologists not used to dealing surgically with pediatric eyes, it is important to consider the size of the eye before proceeding with vitreoretinal surgery. The size changes as the infant ages. At birth, the sclera is thin, about 0.3 mm to 0.4 mm. In infants undergoing scleral buckling, type 40 or type 41 bands may be preferred. In older children (typically 3 years and older), type 42 or type 5 bands may be more appropriate. In the full-term infant at birth, the pars plana is not developed, and the safe region for entry into the eye is less than 1 mm posterior to the limbus. As children age, the space for safe entry into the vitreous broadens, but it remains smaller than in adults through much of childhood. Visualizing the pars plana region, for example with indirect ophthalmoscopy, is the best way to ensure safe vitreous entry. It is best to visualize the entry site into the vitreous up through 5 years of age and in any child with a developmental or genetic abnormality that affects the anterior segment. If direct visualization is not possible, transillumination may be helpful. If possible, limbal entry with an anterior chamber maintainer (Figure 1) or a butterfly cannula should be used for infusion in young children, especially if choroidal detachments are present. Figure 1. Anterior segment approach with anterior chamber maintainer and limbal incisions. In acute trauma, urgent globe exploration with primary repair of open-globe injuries and removal of IOFBs is key. Prompt closure of open wounds reduces risk of infection and additional expulsion of ocular contents due to eye rubbing, which is more difficult to control in young children than in adults. When an IOFB is present, it is helpful to know the composition of the foreign body and whether it might contain copper or iron, which are toxic to the eye. Ask family members if they can offer any information. Removal of an IOFB can be approached a number of ways. If the cornea is severely traumatized and there is no view to the posterior segment, a generous circumferential incision through the pars plana may be created, based on the size of the foreign body as assessed by CT scanning. A magnet or gentle pressure can be used to express large IOFBs. 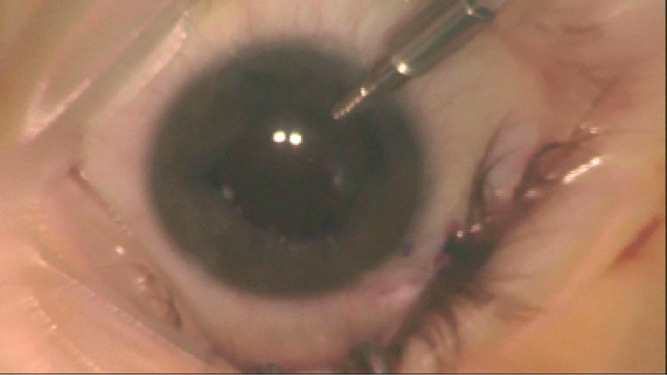 Smaller IOFBs can be removed using a two-hand technique during vitrectomy when the view is clear. The IOFB is first lifted anteriorly and viewed in the pupil. It is then transferred to forceps in the other hand and removed through the pars plana. The sclerotomy may need to be enlarged to prevent the IOFB from falling posteriorly and enable it to be expressed. The instruments used for vitrectomy in trauma may be larger than those used for other types of pediatric retinal surgery. For example, in older children, 20-gauge serrated forceps are helpful to remove small and medium-sized IOFBs. Preoperative and perioperative antibiotics are often administered systemically and sometimes into the vitreous when IOFBs are present, to reduce the risk of endophthalmitis. It is helpful to consult with an infectious disease specialist to ensure that the antibiotics chosen have adequate coverage for expected pathogens. The child should be monitored for toxicity from the antibiotics. If the lens is traumatized and develops into a cataract precluding adequate visualization of the posterior segment or causing inflammation, it can be removed using the vitrectomy handpiece. I often remove the lens capsule, depending on the degree and location of the trauma. In most instances of traumatic cataract in the presence of posterior retinal trauma, primary intraocular lens implantation is not advised. It is important to collaborate with other services, such as social services, and to ensure that the infant is stabilized. When nonaccidental trauma is suspected, images of the retina should be taken to document the trauma. Figure 2. 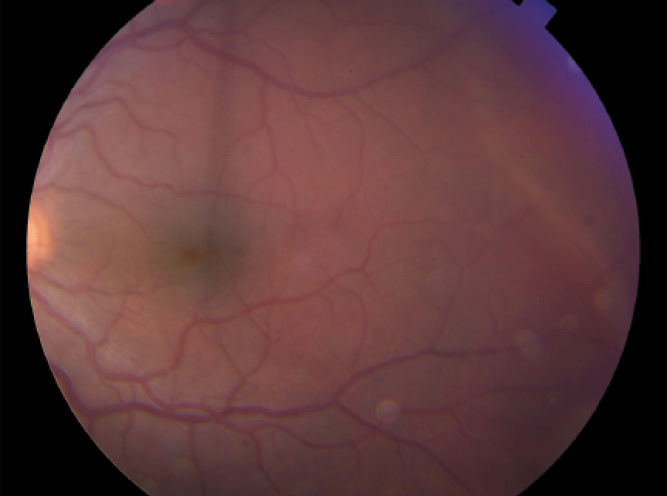 Posterior retina of left eye shows numerous hemorrhages in an infant with abusive head trauma. Figure 3. Persistent subhyaloid hemorrhage in right eye of infant following abusive head trauma. Persistent subhyaloid hemorrhage over the macula (Figure 3) can be amblyogenic or lead to development of myopia. If the hemorrhage settles inferiorly, out of the visual axis when the infant is upright, it may be possible to prop the infant upright while he or she is awake and delay or even avoid surgery. A lens-sparing vitrectomy to remove vitreous hemorrhage and release subhyaloid hemorrhage may be considered if the hemorrhages do not clear. If surgery is determined to be necessary, the timing of the procedure should be planned in consultation with the surgical team and a pediatric ophthalmologist. Because extensive schisis cavities can lead to tractional retinal detachment from secondary intravitreal neovascularization (Figure 4), it is also helpful to perform a subsequent EUA and wide-angle fluorescein angiogram. Figure 4. B-scan of right eye shows tractional retinal detachment and vitreous hemorrhage that occurred several months after abusive head trauma. Figure 5. 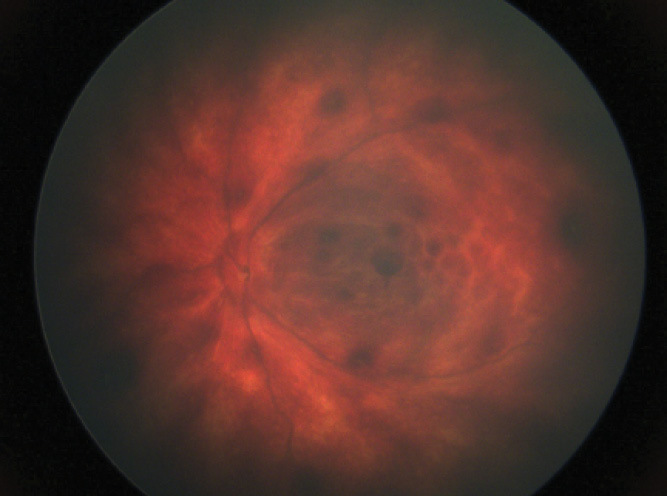 Fundus image of the left eye of a child shows a superotemporal retinal detachment due to a dialysis that occurred 11 months after the patient underwent vitrectomy and received intravitreal antibiotics for endophthalmitis 2 days after repair of corneal laceration. Traumatic macular holes may close spontaneously. Most studies suggest surgical intervention after waiting 3 to 6 months to allow time for spontaneous closure. Sometimes topical steroids and nonsteroidal antiinflammatory drops are used before surgical intervention is considered. For patients with chronic retinal detachments associated with ocular trauma and peripheral retinal breaks (Figure 5), we often place a scleral buckle initially, perform limited cryotherapy to surround the retinal breaks, and then drain subretinal fluid externally to effect a good buckle contour. It can be difficult for a child to fulfill postoperative positioning requirements after vitrectomy, so performing a buckle without vitrectomy minimizes the stringent positioning required. If postoperative positioning is required after vitrectomy, it is helpful to remind the family and the child that daily positioning means most of the day—not just a few minutes a day. Specific requirements for achieving adequate postoperative positioning vary with individual patients. In chronic retinal detachments, preretinal membranes may interfere with sufficient attachment of the retina. We often wait about a month, and, if there is persistent retinal detachment, we then perform a vitrectomy to peel any tractional preretinal membranes and release the vitreoretinal traction. If the retinal detachment is mainly tractional, we typically do not perform an intentional retinotomy as we might in an adult patient. However, when posterior breaks are present, we perform scleral buckle, vitrectomy with internal drainage, endolaser, and silicone oil tamponade. Postoperative follow-up is crucial to monitor the eye for retinal detachment or infection and to determine whether additional procedures are needed. Sometimes follow-up examinations require sedation. Infants can typically be swaddled and held for an examination using topical anesthesia and retractors or a lid speculum. When treating pediatric patients after initial trauma, in addition to prescribing an antibiotic, a topical steroid and a cycloplegic should also be considered to address inflammation, which is a problem in infants and children. Intraocular pressure should be monitored in these patients because there is greater risk of intraocular pressure rise from steroid use than in adults. If intraocular pressure is elevated, I prescribe a topical or oral carbonic anhydrase inhibitor or a topical beta blocker under the advice of a glaucoma specialist with expertise in treating children. A general ophthalmologist can close an open globe, but a pediatric retina specialist should be consulted within a few days to plan for next steps. 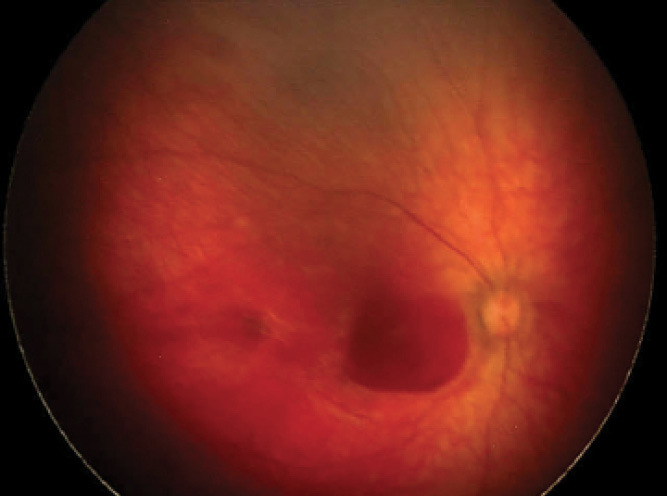 In the pediatric eye, penetration beyond the limbus and the presence of vitreous hemorrhage raise concerns that retinal detachment will develop later. Therefore, in the event of perforating globe trauma or rupture and vitreous hemorrhage, I release anterior-posterior traction soon after the initial trauma when the media are still relatively clear and before fibrovascular bands develop. 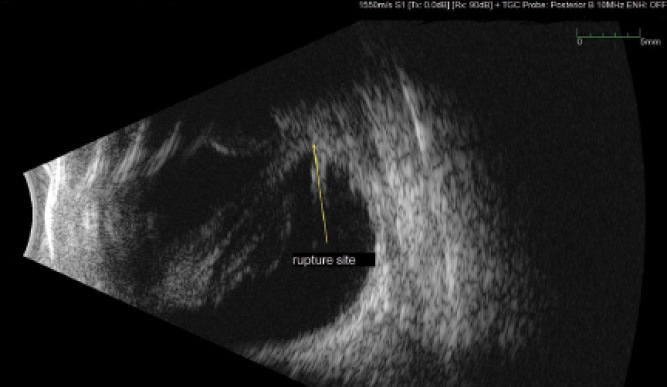 Vitreoretinal traction that cannot be assessed during clinical examination can be evaluated by B-scan ultrasonography in order to plan where to enter the eye to segment the vitreous band causing traction (Figure 6). If the cornea is traumatized but the view is adequate, I proceed with vitrectomy without keratoplasty to release vitreous traction. Wide-angle viewing systems can be used to improve poor visualization. Figure 6. B-scan ultrasound following a corneal laceration and perforating trauma in a patient’s right eye. 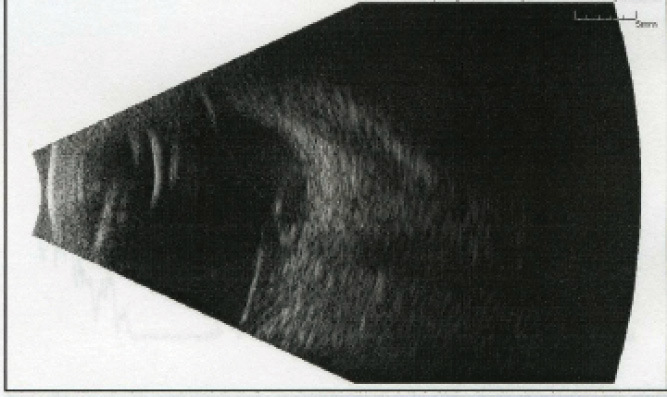 Echogenic blood can be seen along the path to the perforation site posteriorly. It is possible to operate from the 12-o’clock position or from either side of the eye in an infant or child to optimize the view and address the surgical goal of releasing vitreoretinal traction, even if vitreous blood cannot be fully removed. Subsequent procedures may be needed to repair retinal detachments that develop or to address vitreous hemorrhage and other media opacities resulting from corneal lacerations and cataracts. These procedures should be performed in consultation with a cornea specialist and pediatric ophthalmologist to optimize timing and to reduce the effect on amblyopia. If later retinal dialyses become apparent, these can often be treated with a scleral buckle. It is important to distinguish a dialysis from a giant tear, which often requires vitrectomy for repair. Ocular trauma, especially blunt trauma with hyphema and posterior findings, can lead to later retinal detachment or glaucoma. Lifelong follow-up is important to assess for complications related to posterior trauma. Wearing protective eyewear at all times is important. Surgery for pediatric ocular trauma is often performed at a pediatric hospital so that a pediatric anesthesiologist and other experts can be on hand to care for any other organ system injuries. It is essential to have proper equipment and an OR team with expertise handling pediatric retinal trauma emergencies. OR staff should be familiar with the setup and use of the vitrectomy console, instruments, endolaser, scleral buckling elements, cryotherapy, and silicone oil, and be able to troubleshoot problems and anticipate operative needs. The surgical team must also have available and be familiar with the use and preparation of the microscope and wide-angle viewing system. When pediatric retinal trauma is present, the trauma often involves other areas of the eye as well, and experts in anterior segment, oculoplastics, glaucoma, and pediatric ophthalmology may be needed. In infants and young children, media opacity from corneal scars, vitreous hemorrhage, and cataract can cause amblyopia, so it is important to work closely with a pediatric ophthalmolo-gist to appropriately plan how to minimize amblyopia and ensure postoperative visual rehabilitation. Pediatric retinal trauma may present late because of the unique aspects of obtaining a reliable history in children or the late recognition of vision loss in one eye. Depending on the individual case, performing careful follow-up and working with experts in pediatric ophthalmology, cornea, and/or glaucoma, may be needed in order to address other conditions. Psychological services and social work are important for the patient and family. Despite advances in our understanding of the pathophysiology of complications in ocular trauma and improvements in vitreoretinal surgical techniques, prevention remains the best strategy for preserving the visual acuity of our patients. Wearing protective eyewear specific to a sport or activity is important. Data from the US Eye Injury Registry show that children who experience eye trauma are less likely to wear protective eyewear than adults.3,4 Young children are more likely to be injured at home, but older children are more likely to sustain sports-related injuries. Thus, it is valuable to educate athletes, coaches, parents, and the public on the importance of protective eyewear. Once trauma has occurred, it is equally important for the patient to wear protective eyewear, even if refractive correction is not needed. 1. Caputo G. Nonaccidental head injury. In: Pediatric Retina. 2nd ed. Philadelphia, PA: Wolters Kluwer/Lippincott Williams & Wilkins; 2014:682-688. 2. Levin AV. Retina hemorrhage in abusive head trauma. Pediatrics. 2010;126(5):961-970. 3. US Eye Injury Registry. useir.org. Accessed June 1, 2018. 5. Stryjewski TP, Andreoli CM, Elliott D. Retinal detachment after open globe injury. Ophthalmology. 2014;121(1):327-333. 6. Meier P. combined anterior and posterior segment injuries in children: a review. Graefes Arch Clin Exp Ophthalmol. 2010;248(9):1207-1219.